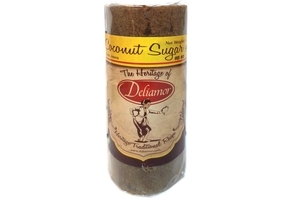 Deliamor Coconut Sugar (Gula Jawa) in 17.6oz (500g) pack. Coconut palm sugar is a golden brown sugar sold as granule, blocks or liquid. It may be light-colored or dark, soft and gooey or hard. As a product of cottage industry, it varies greatly from batch to batch. Product of Indonesia. Halal Certified حلال .